Before asking us a question, please review the ones below to see if it wasn't already answered for you! Q: When do you open for commissions? Q: How long is my quote valid for? A: Your quote is only valid for 30 days and after 30 days . You must get a new quote. Q: Do you accept payment plans? A: Absolutely! We can help you set up a payment plan upon commissioning us. We usually require a minimum of $100 per month after the 35% down payment. A: Paypal is preferred, but we do accept money orders . Cash can be paid in person, but not through the mail because of risk of it being lost or stolen. Q: I am under 18 years old, can I still commission you? A: We work with parental consent and a drawn up contract with the parent or guardian. Q: How much do you charge for your suits etc? A: You can find our base prices over on our pricing page. Q: Do you take commissions for partials, 3/4 suits, hands/feet/tails etc? Q: How much is shipping and is it included in the price? A: Shipping is not included and will be calculated upon completion of the costume. A: Yes We do the buyer pays shipping. Q: Do you do artistic freedom suits? A: Yes we do! We love designing critters to make into suits and can even show you our ideas! We Also love Mystery Suits. Both types of suits are offered at Base pricing. Q: Do you make copyrighted characters? A: No. This includes stuff from Disney, Pokemon, Digimon, animes etc. Because of copyright laws we are not allowed to re-create a character for money. Q: Why do you usually only open for fullsuit commissions? A: We enjoy making the full character and it ensures that all of the parts match up and flow well with each other. If you decide later that you want parts from either us or someone else, sometimes it doesn't work out because fur dye lots can differ or the fur may not be available anymore. Q: Is concept art required to get a fursuit from you? A: Yes. It must be at least 3 views and show all of the markings and colors clearly. We do not go off of descriptions. Concept art is not needed for an artistic freedom suit. Q: Am I only allowed to get concept art from your concept artist? A: No, you may use concept art that you or someone else has made. You may get concept art from Our Concept Artist to have a better idea of what your suit will look like since it is made in our style. Our concept artist will also help you figure out what would look best as a suit. Q: How long have you been making suits? Q: How many people work for Sugar N Spice Costumes? A: There are 4 of us here at Sugar N Spice Costumes that make all of the creations: Bullie ,Neo, and Ginger. Our concept artist, Littlebobleat is also considered a part of our business! Q: Do you guys have certain parts of suits that you each do? A: Somewhat! . Neo makes bases ,finishes heads,and makes body suits. Bullie furs heads , builds parts and designs our patterns. Ginger cuts out all of our bodies . A: We use a lot of materials such as fleece, felt, lycra, minky, vinyl, and plastic, but the main material is faux fur. We do not use real fur, nor do we use poor quality fur on our suits. 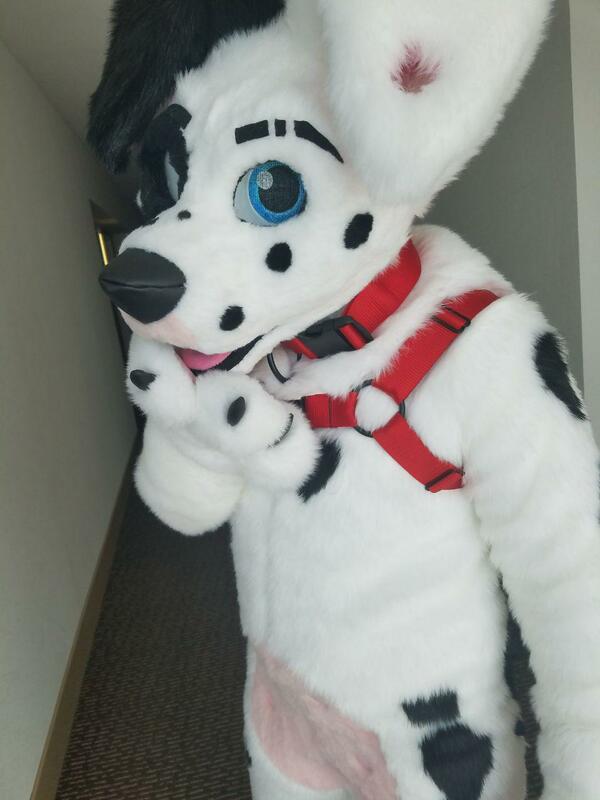 We prefer to use softer/more plush material for small details to keep our suits as soft and cuddly as possible! Q: Where do you get your fur? A: We buy all of our fur in person in the Los Angeles Fashion District. No they do not have a website . Q: How long does it take to make a fursuit? A: Depending on complexity, it can take anywhere from 1-3 weeks to make a fullsuit if it is the only suit being worked on. Q: When will my suit be finished? A: We do not do completion dates, but We do offer Rush orders for an additional fee.We can give you an approximate completion month, but it is not guaranteed since we do not like to rush and also have other suits in our queue to make which change around quite often depending on payments. If you want to see where you are on the queue/the status of your commission, you can find that info on our Trello. Q: What is required from me when I commission you? A: Depending on what you are getting, you'll need a Duct Tape Dummy, hand tracing, vans style slip on shoe and measurements of your head. Q: Are your heads glasses-friendly? A: We can make them that way if you wear glasses! Q: Are your heads built on a balaclava? A: Yes ! Our heads are lined with lycra so that it is comfortable and no foam shows. A balaclava can be worn underneath and is usually supplied by us! Q: Do you use molds for your heads? A: No we don't. We like to keep every head unique in it's own way. Every head is sculpted by hand with foam. Q: Do you sell foam bases? A: No, we prefer to sell our work completed and as our own. Q: Do you do follow-me eyes? A: Yes we do at an additional charge. Q: What about glass eyes, moveable jaws, silicone pawpads/noses, or plastic claws? A: We do not do any of those since our suits are strictly toony. We like to keep our work our own, so we do not use parts such as claws made by others. Q: Can you do LEDs? A: Maybe, we aren't very knowledgeable with LEDs but it is a possibility. Q: Do you airbrush spots, stripes, or other markings? A: No, we have a toony/plush style so we like to keep everything sewn instead of airbrushed. Q: What type of footwear are your footpaws built on?